Isla Mujeres is a secluded island sanctuary just over six miles northeast of Cancun, surrounded by crystalline waters and near amazing coral reefs. Isla Mujeres’ terrain is flat with some of the whitest beaches in Mexico on all sides. This charming island is only five miles long and half a mile wide with a downtown area of just four by six blocks. A secluded, laid-back retreat, Isla Mujeres seems worlds away from modern, high-energy Cancun, but visitors will still find great restaurants, fun bars and wonderful artisan shops in the colorful downtown area. Long ago, the island was used by the Mayans as a sanctuary celebrating Ixchel, the goddess of love and fertility. According to legend, when the Spanish arrived they found many stone statues of women, carved in honor of the goddess. It is from this tale that the island gets its name — "Isla Mujeres" (The Island of Women). With world-class diving and snorkeling, Isla Mujeres is quite popular with families who want to snorkel and scuba dive together. Many of the dive spots around the island have a depth of only 30-40 feet and an average water temperature of 78-82 degrees. The extraordinary variety of terrain, plant and sea life offers an exciting dive for the beginner as well as the more advanced diver. There are plenty of on-land options as well! A visit to Isla Mujeres is not complete without renting a bike, moped or golf cart and exploring the entire island. You can visit the Turtle Farm and see the majestic sea turtles, stroll through Hacienda Mundaca, have a relaxing massage and, of course, shop! Isla Mujeres, The Island of Women, is a place where time passes slowly and your dream vacation becomes a reality. An Isla Mujeres vacation could be just what you've been looking for! Getting there is easy! Optional round-trip airport transfers to and from the ferry dock are available for pre-booking with your package, but the ferry to Isla Mujeres is NOT included and must be purchased separately at the dock as well as taxi transportation to and from the resort once you disembark in Isla Mujeres. The cost of the ferry from Cancun to Isla Mujeres is approximately $6.50 USD each way per person and taxi to the resort is around $5.00 USD. This fare will apply for all ferry companies that cross from Cancun to Isla Mujeres and vice versa. The first crossing is at 6:30 a.m., and beginning at 9:00 p.m. express boats leave every hour until midnight. 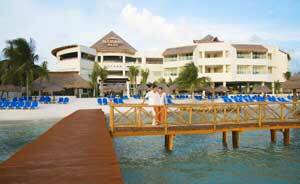 Please Note: Isla Mujeres has instituted environmental taxes that will be charged to the traveler at hotel check-in. These taxes are generally only around $1 - $1.50 USD per room per night. If you are being charged this fee it is your responsibility to pay for this since it is not part of your prepaid vacation package. Experience Palace Resorts' boutique-style all-inclusive resort for Couples Only (18+), on the beautiful bohemian island of Isla Mujeres. Enjoy outstanding service, 24-hour room service, double Jacuzzis in every room and valuable extras with Resort Credit promotions!